Cattle fattening business is one of the most profitable businesses in Bangladesh. There are great demands of different type of cattle that are imported from other countries. This is because the business is very much suitable for those who are hanged on seeking of 9 to 5 jobs. As dairy cattle are used for milk production, beef cattle are cattle raised for meat production. And it’s known as beef of the meat of mature cattle. It starts at cow-calf operations of the production cycle of the animals. Those who are offspring, this operation is designed specifically to breed cows for them. Although the principal use of beef cattle is meat production, the other uses include leather and beef by-products used in candy, shampoo, cosmetics, insulin, and inhalers. It has become an important business of the small former in Bangladesh of cattle fattening business for beef production. It has already started a small scale commercial beef fattening program in a few areas of Bangladesh. As straw is the important crop residue, it contributes the major portion of the fibrous part of the diet of the beef cattle. With low nutritive value and low digestibility, rice straw is the basal feed for ruminants. For beef fattening, farmers use rice straw of traditional verities, green grass, sugarcane tops, wheat and rice bran, molasses, pulses bran and locally available resources. Also, dressing percentage and also in better carcass quality than untreated straw, urea molasses straw treatment in beef cattle resulted in higher body weight. As a serious constraint to optimum livestock production in Bangladesh, the acute shortage of feeds and fodder has long been identified. And it considers a major constraint to livestock productivity for the nutritional factor. And in Pabna and Sylhet districts have the traditional grazing field is scarce except in some pockets. Although farmers used three years old cattle for beef fattening and maximum growth rate is 1.1 year to 1.4 years of age, the cattle fattening period is 4.5 months in rural areas of Bangladesh. It can be hard to identify each one as there are more than 70 recognized cattle breeds in the US for cattle fattening business. But, for commercial beef production, there are a small number of cattle breeds. 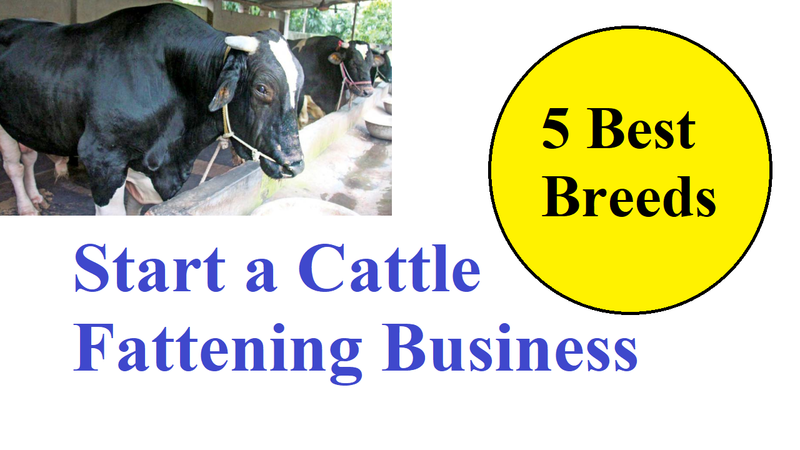 Now, let’s know the top 5 best breeds of a cow for beef to start a cattle fattening business in Bangladesh. The most prevalent beef-producing breed is the Angus if we say more specifically its Black Angus. Although some of this is the result of history, Scottish Angus stock was the first cross-bred with the exclusive longhorn herds brought over by the Spanish. Angus was initially disdained, the improvement in flavor and tenderness over the tough, lean longhorns made quick converts of cattlemen and their customers though they are polled, or hornless. Also, they no only have the ability to turn to graze into bodyweight but the low rate of birthing problems. And it requires a greater than 50% black face and adherence to 10 quality standards for the Certified Angus Beef program. Besides, British cattle tend to have lower shear force values than continental breeds furthering their popularity. Moreover, being the fastest with the most has made Angus beef number one in the U.S, paired with an aggressive marketing campaign. As Hereford cattle are another British breed, from Herefordshire, England, they’re also noted for their hardiness and adaptability to a variety of climates. And it’s 51% or more white with no white markings on the hip since designated Certified Hereford Beef. This is not only less expensive than Angus but the compact, short-legged Herefords are more efficient then most breeds at converting pasture to prime beef. The principal reason they are often cross-bred with other breeds is quality and hardiness. But, the question is that how you’ll collect the breed. Don’t worry because we’re here to help you. Simply the Crystal River Meats and DeBragga are two of the online sellers we surveyed who offer Angus-Hereford breeds. The beef of Piedmontese is considered as the Arnold Schwarzenegger’s beef. The breed has a distinguishing genetic anomaly called “double muscling”, which is Originating in the Piedmont region of Northwest Italy. As it’s the result of an inactive myostatin gene, it gives Piedmontese cattle less marbling and chemical fat (3.8% vs. 5.6% for Angus) and higher protein content with the controller of muscle development and double muscling. This is because it’s a healthier choice for beef lovers. A University of Georgia study showed no significant difference in shear force values between normal muscle and double-muscled beef while you might think this would mean sacrificing tenderness. But, Piedmontese bulls are cross-bred with Angus cows because delivering a double-muscled calf often proves difficult for Piedmontese dames due to narrow birth canals relative to calf size. That’s why it’s one of the best breeds for a cattle fattening business. Wagyu is the most oft-misunderstood beef, which is couched in the mystique borne of the rarity. As Wagyu literally means “Japanese cattle”, it comprises four breeds originating from an infusion of Continental. Or, it’s in European, stock (mostly Swiss) created in the early 1900s during the Meiji Restoration. Whereby geneticists individually select each sire and dame for their genetic compatibility, a concerted breeding program post-WWII has led to one of the most refined. It’s for the homogeneous stock of cattle in the world. Despite the controversy, it’s one of the best breeds for a cattle fattening business.